Good morning and welcome to Pink Saturday which is hosted by Beverly at How Sweet the Sound. I would like to share with you my little china hutch in my breakfast room in all of it's PINK gloriness. It really is one of my favorites PINK toys at the moment! And guess what? It is filled will lots of PINKness. So I'll just let you look and see for your sweet little ole PINK self! Here you can see some Pink Willow dishes and a Pink Willow tea pot! I know the bird salt and peppers aren't PINK, but hey, they look so nice up against a PINK dish. I really do believe these little birdies think they're PINK. They love it here! So I'm certainly not going to tell them they're actually white! Some various pink transferware plates and cups here. See the backboard of my little hutch. It looks so PINK in this photo, but it's not. I covered the back with a tiny tiny little red and white check - hey, red and white mixed together make PINK! Now, did I ever tell you how clever I was? I'm so proud of my sweet little PINK backboard hutch. More views of wonderful PINKness. See, I even dusted away the PINK dust bunnies for you! I do just love these little bird sweeties and actually have a couple of sets of them. When I have a dinner party I will put a set at both ends of the table. Only if my table setting is PINK! Wish these little birdies came in PINK. I found them at Target and thought they were just the cutest little things. Oops! We're supposed to be doing PINK here! Okay, back to the PINKness. I just love this little pink cake stand, although it's rather small. Can you love a cake stand? Of course, especially if it's PINK! Don't believe a cake would actually fit on it, even if it were PINK! Instead of a Volcano Cake (you'll know what I'm talking about if you've read about my fallen cake) I would have a flowing lava cake if I put my cake on this tiny little PINKie! Under the glass dome is a salt and pepper I've had since I was a little girl. Alas, they are not of the PINK variety. Shoot! Of course I was roostering way back then too! Do roosters come in PINK? Here's some of my PINK Depression glass. I just love this stuff too! I think I love just about everything! The large bowls with the smaller ones are called a Berry Set! I would love some cherries in one of those little bowls right now! PINK cherries, yessir. These glasses are very old and PINK! I have had them a very long time, too! I have always been PINK! Now this little cuteness is not exactly PINK! But I'm so sorry for him, because as you can see the poor little thing is crying. So I must mention my Pie Bird! We'll just pretend he's PINK! Stay PINK and rock on! *** Make sure you look at yesterday's post so you can take part of a challenge I'm putting out before you! The strongest oak must fall. I love your PINK stuff...the Pink Willow and Pink Depression glass is my favorite stuff!! ***Thanks for the email...I'm back on!!! What girly fun it would be to sit at your table with all your bathroom divas table set with all your pinkness .A lovely collection! I usually participate in P.Sat. but this a.m. I just didn't get it together! Great china collection and your Diva doggie..too cute! Morning sweet Pickle! beautiful pink post girl..I love those pink willow dishes..I even did a pink Saturday post today (I believe Beverly is sending hypnotic messages thru her comments to me!!!! lol lol) Have a great weekend Pickle! Well your hutch certainly is pretty in pink! Some of your pieces look so familiar. I had to go into my cupboard and I have three bowls of my great grandmothers with the same oak leaf and acorn border! I absolutely LOVE all of your pink-ness in your hutch!! It is all just beautiful!! Also, I have quite a fondness for little white birdies going on right now and I just adore those you have. Have a great Pink Saturday! What a wonderful cabinet to hold all of your beautiful pink things. I know your little birdies don't mind not being pink because they get to stay with all of the wonderful pink dishes. ooh, I love all your beautiful pink stuff. Now that pie bird. Does it have a use, or is it just decorative? Beautiful pink! Your comment may explain why I can't respond to some people too. If you find a way around it let me know! So many beautiful pink treasures! Your dishes are beautiful and so is the display. Love it all. Happy pink Saturday. Crumpet just fell in love with Chloe....maybe it's because she looks so good in PINK! Oh, I love all of your pink depression glassware and pink transferware! And the little chickies in the cake plate are too cute! Very pretty "pink" display. Those naughtly white birds! And Chloe Dawn, she can be whatever color she wants to be! LOVE all your pretty pink dishes!!! :) Happy Pink Saturday, xo! What a terrific pink post! I really love everything there from the pink background, pink willow, pink transferware and pink depression glass. I have a particular fondness for pink depressions glass and I have a few pieces of my own if I could just find the box I put it in when I moved here! I really adore that pink cake stand! Ooh, Ilove that transferware plate shown behind the dove S & P's. How intricate and gorgeous. I love transferware and depression glass. But haven't found just the right things (and cheap enough) to start my collection. I have the cheap blue and white transferware wannabes from places like Ross, but I don't think that counts! Love yours! I love all your pinkness of things! Your hutch is lovely with those beautiful dishes...and the bird too. Even Chloe is in on it. Such fun. Loved your pink post. I have a little pink depression glass - but inherited green depression glass from my grandmother. Also, my dishes are similar to yours, but are blue and white Currier & Ives. Yours are great, also. I just enjoy dishes and crystal that are antiques and collectables. So thanks for sharing. I love your pink post! Love the dishes and that little cupcake stand, the pink backboard hutch...love it all! Your collection of pink depression glass and pink transferware makes a stunning statement. What a lovely collection and so beautifully displayed. Earthly treasures for sure...! I love your pink willow dishes and pink depression glass. I think that the red and white check behind them is a great way to show them off. Love your cute little pie bird too. He's almost pink! Love, love, love your china. There's some Old Castles transferware at Home Goods right now calling my name. The little birdies look right at home on that shelf...so cute. I LOVE your hutch and all your PINK pretties! Clever what you have done with the fabric on the inside of the hutch! Also, I LOVE your pie bird! I have been looking for one! P.S. I love your picture that comes with your post! You made me smile with your sweet smile! 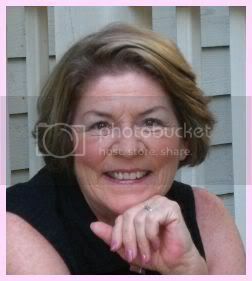 Hello Shelia, I am soo late visiting everyone for Pink Saturday, but better late than never! I just love all your pink in your cabinet. Those depression bowls are beautiful along with your china. I also like those sweet little pie birds - even though they are not pink. And your dog with the pink baby, darling! I love all of your pink! It's always fun to see what you have to share on pink Saturday! Such beautiful *pink* treasures! I'm not sure I've ever seen *pink* willow dishes before! And I adore that little *pink* cake stand, so cute! Hi Sheila, Happy Pink Saturday! I love your hutch, sure red and white make pink so your right on track! I love that pink cake stand. Miss Chloe Dawn has a pretty pink toy to show off too! What is that meter thing you were talking about? I hope I don't have a problem with it.I finally got my vacation post up but since I was working on it before my pink Sat. went up it's below it, so when you have time stop over and scroll post sat post and you can read all about my vacation!